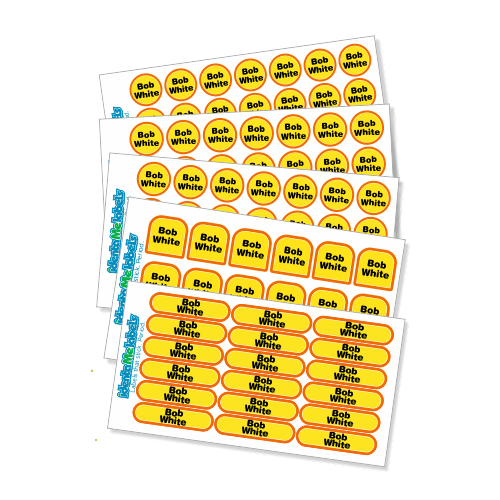 Our nursing home labels pack has all the labels you need to get started. 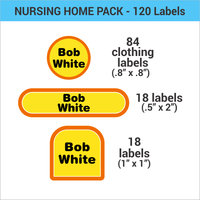 Our stick on nursing home labels pack is definitely the easiest way to label clothing and personal items. 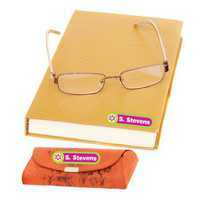 Put a label on everything that will be staying at the nursing home or care facility. 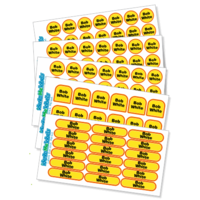 The Nursing Home Labels pack has you covered. 18 - Small Rectangle labels for personal items, (NOT for clothing). 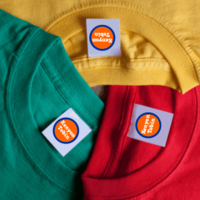 For Clothing: Stick to garment care tags or brand stamps. Saves you 17% vs. buying the same labels separately! 84 Small Round Clothing Labels 0.8" x 0.8"
18 Small Square Labels (also for clothing) 1.0" x 1.0"
18 Small Rectangle Labels (not for clothing) 2.0" x 0.5"
Our Nursing Home Labels Pack contains all the nursing home labels you need to help your loved one in any assisted living or nursing home facility. 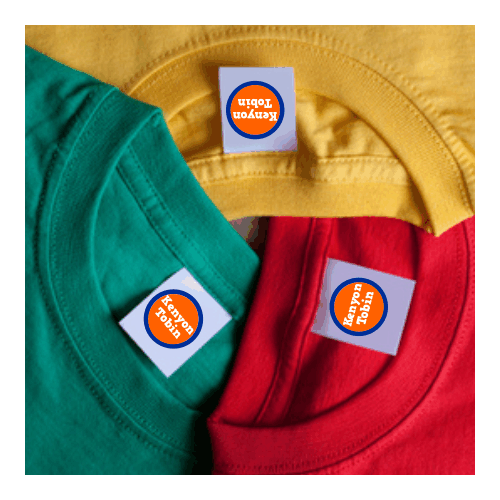 Our stick on labels are the easiest way to label all of their clothing, valuables and essentials and make sure their things don't get lost. Label clothing, footwear, towels, jackets, bedding, bathrobes, toiletries, glasses case, cane and all of their personal items and valuables. All of the clothing labels for nursing homes are peel and stick, and have an industrial strength adhesive so they'll stay stuck! The labels are very thin and lightweight so they won't irritate the skin. The 102 smaller clothing labels (round and square) are laundry-safe and laminated so they'll stay looking great. The 18 waterproof small rectangle labels in this nursing home pack are dishwasher-safe, (NOT for clothing). Stop wasting money replacing clothing and personal items by personalizing a Nursing Home Label Pack today. Do you have little ones that go to daycare? Check out our Daycare Pack! Product Safety Information All of our labels are made with non-toxic materials and eco-solvent inks. Our labels are super sticky and durable but they're not truly permanent. They're made to come off with intent. Continued picking can make a label come loose from clothing and other materials. 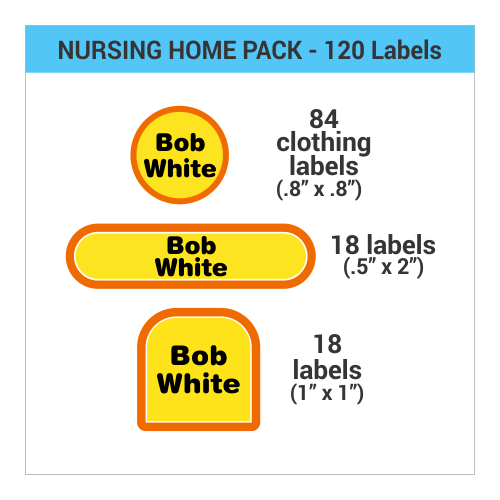 Our Nursing Home Label Pack has both, laundry and dishwasher safe labels. Your Nursing Home Labels Pack will ship using USPS First Class mail unless you choose one of our faster options when you checkout. The faster options are USPS Priority USPS Express, and FedEx Three Day. We can also ship your labels using UPS or other FedEx options - just give us a call and we can work out the details and the cost with you. If you'd like to provide us with your UPS / FedEx account number, we'll have your account billed directly. keep on producing such a great product!!"